Call it the “don’t look at the train crash, don’t eat those cookies in the kitchen or taste this, it takes terrible” psychological scenario. Don’t go near the Red Shirts protest site. Don’t, 32 governments have issued warnings about being near the protests. Don’t go. That is, unless someone gives you a free ride, you get caught up in the moment and suddenly you witnessed viral marketing at its best. The tractor beam was calling, step into the light. 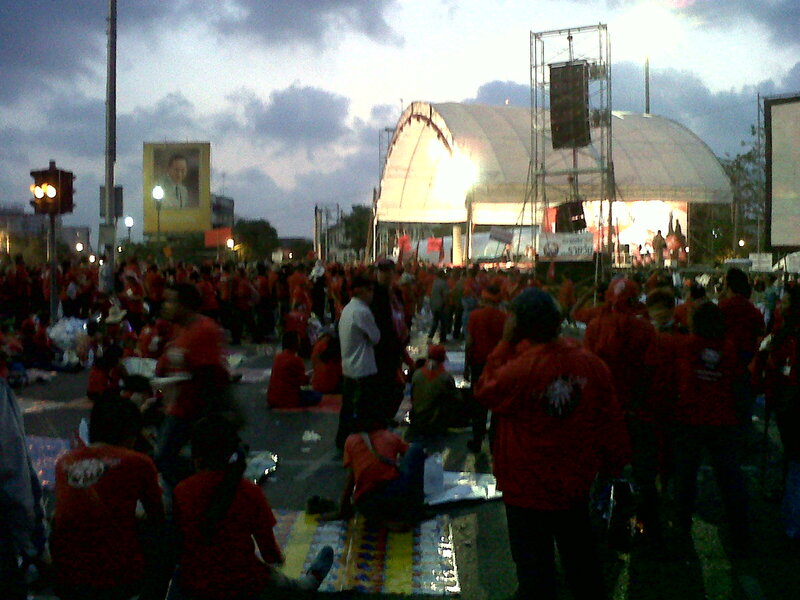 Extenuating circumstances arose that lead me to be at the Red Shirt rally at 5:30 on Sunday morning (14 March, 2010). The circumstances included: Singha, Thai friends, not leaving a bar at closing time (2am) and friendly smiling faces of red clad people streaming down the street in cars. It was 5a.m. on Sunday, I was standing with 2 Thai friends on a corner of Suhkumvit road, walking home. Suddenly 4-5 cars came by, playing Thai music, red flags draped on the cars and loaded with people dressed in red that were waving, smiling and yelling Sawadee!!! The evil Red Shirts? Hmmmm. I didn’t really feel afraid, I really like the music from the North of Thailand, it bounces along, you don’t need to know the words. I had too much to drink, the window of opportunity for me to actually move with the music and go with the moment arrived with those cars. We stood on the corner waving, smiling at the 10 cars and trucks that went by, then the next set of 5, then another group of 6 or 7. I had the tunnel vision of someone that had been drinking for an extended time; everyone in the cars was smiling at me. I was the smile in the land of smiles! 20 minutes later I was across town, walking to the main stage of the protest site in a sea of red. Bumping up through the fog covering logical thought were the voices- this is not a novelty, this is not a joke, this is not a game. These people are here to change their country, many have driven for hours in the hot sun, been stopped at multiple road blocks, slept just outside Bangkok and are descending on the city to walk the streets for change of the government. The vast majority of people are not wealthy and have struggled for everything they have; the former PM did many things to assist them with health care, equal rights and laws and business opportunities and is there hero. As I have written in earlier blogs- I respect protestors. After living in the USA through the post 9-11 wars and climate of “don’t ask, we don’t have to tell”, I fully support a peaceful protest and respect the commitment and passion to protest. And the red shirts were very nice. The shock to see a white face in the middle of the crowd brought huge smiles to people’s faces- I was hugged kissed, fed, given water, my hand was shaken 20 times. What I could not shake was the guilt of being there. I am a good drinker with years of practice with many well-qualified partners; I am not a rank amateur that is overrun by emotion after a few rounds. Ah, but look at me. At a protest just to look around, did I think this is some show or adult Disney land? I am respectful, but how is that enough to justify being in the middle of a sea of people fighting an uphill battle to change their government? The nicer people were, the deeper my turncoat feelings ran. A man was addressing the crowd from the stage, the sun was coming up, I am an American standing in the middle of a protest in another country, a sightseer. A privileged sightseer from a country that fought wars that destabilized Southern Asia for 30 years and brought loads of stress upon Thailand during that time, an interloper from the country that lead the world into economic crises in 2008 and 2009 that slashed exports and investment from Thailand and costs thousands their jobs. Yet, I was being welcomed and kissed and hugged. Uggh. I go back to my apartment to sleep all day in the air-conditioning while the people being kind to me continue their protest. But don’t these people understand, you cannot have a protest and change the government! We all know that in America, that is why we do nothing! If things were that simple, governments would be changing each week! This was my next line of thought with the sun now fully up, providing me the ability to look around and gauge the size of the crowd. How can a crowd of 30,000 (later rising to closer to 100,000) think they can topple a government? Bangkok is 11,000,000 people, Thailand is over 65,000,000. What is the accurate size of a protest that will topple a government? 20% of the population? That would mean a protest in the USA would need to draw 40,000,000 people? Is that why we don’t protest? No, in the USA we don’t as we are all busy protecting our own person interests, tweeting clever things and updating our facebook pages about all that is right and wrong without having to get out and do anything about it. This protest was about doing the illogical to show a different way- wasn’t I recruited into the protest by viewing the commitment of the people in the cars? Wouldn’t it have been easy to bumble the 2 blocks home instead of cross-town to see the sunrise over the Red Shirt stage? But, these people were doing something, committed to something and believe in something other than downloading a new application for your phone to show your friends the fun you are having. Not talking about change, putting change into action. With my mind free to be in the moment and think all of these things while standing at the protest I had a wonderful time. I hope there won’t be any violence. I hope all Red Shirts and protestors are safe. I have no right to express the right and wrong of the Red Shirts and what they wish to accomplish, I am a visitor in this country. I have tremendous respect for the passion, energy and commitment the protestors are showing to their cause; who knows, maybe others will be standing on a corner somewhere, join the protest, swell the numbers of the protestor and bring about the desired for change. Or, maybe not. Maybe the protest won’t lead to a new Parliament. But at least they tried. 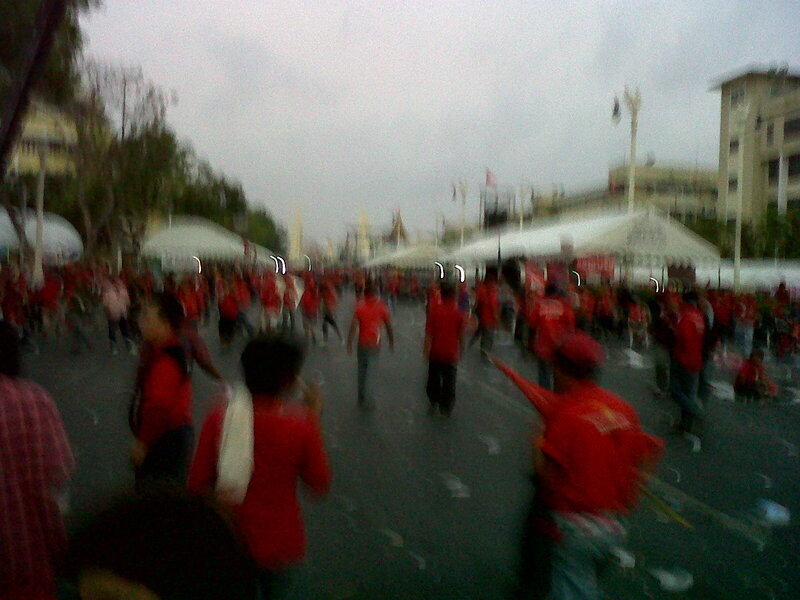 This entry was posted in Bangkok, Politics, Thailand and tagged Bangkok riot, Red Shirt March, Red Shirts in Bangkok. Bookmark the permalink.